STS-121 crewmembers are currently at NASA's Kennedy Space Center (KSC), in Florida, taking part in a practice countdown ahead of their mission to the International Space Station (ISS) in July. The practice countdown, or Terminal Countdown Demonstration Test (TCDT), is considered a key training exercise both for the astronauts and the KSC launch team. The exercise gives engineers an opportunity to run through the preparations leading up to a Shuttle launch. It also serves as a launch-day dress rehearsal for the astronauts. 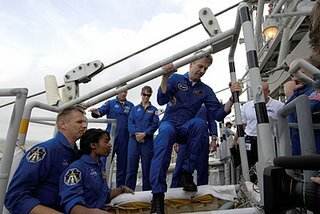 The STS-121 mission crew arrived at KSC on Tuesday after a one-day delay due to stormy weather over Florida. On Wednesday the crew visited Launch Pad 39B where Space Shuttle Discovery stands ready for launch. At the top of the launch pad they practiced getting into the slidewire baskets, which would carry the crew away from the pad during an emergency. On Saturday 17 June, NASA officials are expected to host a news conference following a two-day detailed assessment of the readiness of Space Shuttle Discovery for launch. The meeting is expected to produce a number of key decisions about Discovery's mission, STS-121, including selection of an official launch date. The launch window for Space Shuttle Discovery extends from 1 to 19 July.